Rate this project Raffaele Forte has announced the release of BackBox Linux 4.1, an updated build of the Ubuntu LTS-based distribution designed for penetration testing and forensic analysis tasks: "The BackBox Team is pleased to announce the updated release of BackBox Linux, the version 4.1. This release includes features such as Linux kernel 3.13, EFI mode, anonymous mode, LVM + disk encryption installer, privacy additions and armhf Debian packages. What's new: new Ubuntu 14.04.1 base; handy Thunar custom actions; RAM wipe at shutdown and reboot; system improvements; upstream components; bug corrections; performance boost; improved anonymous mode; predisposition to ARM architecture (armhf Debian packages); predisposition to BackBox Cloud platform; new and updated hacking tools." See the release announcement for system requirements and upgrade instructions. Download the BackBox Linux 4.1 live DVD image from here: backbox-4.1-amd64.iso (1,920MB, MD5, torrent, pkglist). Raffaele Forte has announced the release of BackBox Linux 4.2, the latest stable build of the project's Ubuntu-based distribution dedicated to penetration testing and forensic analysis: "The BackBox team is pleased to announce the updated release of BackBox Linux, version 4.2! This release includes features such as Linux Kernel 3.16 and Ruby 2.1. What's new: preinstalled Linux kernel 3.16; new Ubuntu 14.04.2 base; Ruby 2.1; installer with LVM and full disk encryption options; handy Thunar custom actions; RAM wipe at shutdown and reboot; system improvements; upstream components; bug corrections; performance boost; improved anonymous mode; predisposition to ARM architecture (armhf Debian packages); predisposition to BackBox Cloud platform. New and updated hacking tools: beef-project, crunch, fang, galleta, jd-gui, metasploit-framework, pasco, pyew, rifiuti2, setoolkit, theharvester, tor, torsocks, volatility, weevely, whatweb, wpscan, xmount, yara, zaproxy." Read the rest of the release announcement for system requirements and upgrade instructions. 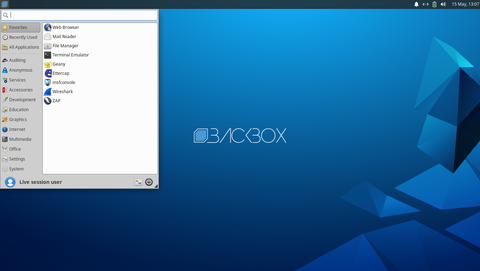 Download the new BackBox Linux live DVD image from here: backbox-4.2-amd64.iso (1,871MB, MD5, torrent, pkglist).